When I started at RCTC, I knew challenges lay ahead of me. Little did I know at the time, but school work would be the least of my concerns. 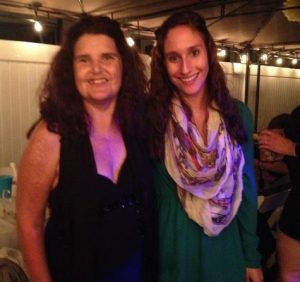 Angelina Labonne, pictured with her mother, Carmella Buffa, at a family wedding when she was 19, is currently a student at the University of Minnesota Rochester and intends to eventually study surgery. The human heart is a funny thing. I studied it in anatomy, looked at its chambers and blood vessels carefully as I tried to remember the flow of blood. Our hearts beat, they race, and they can even ache. They are the biological clock of our complex structure, keeping our body on track 24 hours a day. All of this you probably know, but what you might not know, and I know I sure didn’t, is what it looks like when it fails. When the clock stops ticking. Sixty years, six months and 28 days into my mother’s life, I would watch her clock stop. My mother, Carmella Buffa, passed away last April from a condition known as radiation induced restrictive cardiomyopathy. That means that heart muscle, became too still to pump blood throughout her body efficiently. The radiation that caused this was from her two previous battles with breast cancer. This causes myriad other health problems such as recurring fluid buildup, liver problems, and cardiac renal syndrome. That means not only was her heart failing, but the heart failure was causing kidney failure. The majority of my mom’s days were spent in the hospital. Every morning I watched her weigh herself. I made her low sodium breakfast, set out her dose of medications for the morning, made sure she didn’t drink too much liquid with them for fear of reaching her two-liter daily fluid limit. However, there are some things I never saw my mother do. I never saw her ask why this was the life she was given. I never saw her complain, and I never saw her lose her faith. After my mother’s death, I resumed school and took my final exams. I spent the summer working at the Mayo Clinic as a personal care assistant. I now attend the University of Minnesota Rochester and live four hours away from my family. I plan on applying to Mayo School of Health Science for surgical first assisting with the hope of specializing in, of course, cardiac. 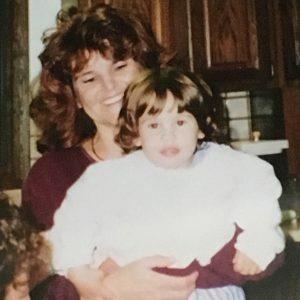 Labonne as a toddler with her mother. When the Echo staff approached me to write this article, I was hesitant. My story is one that people could easily pity. Pity is not what I am asking for. I ran myself ragged for six months bringing my mom to every doctor and specialist I could. I gave her every medication they suggested and controlled everything she ate and drank. I was miserable. Worse, I could never figure out why my mom was so content. Not only in those months of severe sickness, but her whole life. She held her faith close and followed her heart, never wanting for more and simply loving life and loving me. As I struggle with my grief, I find that the idea of “just being” isn’t so crazy after all. Each one of you reading this and myself are doing the best we can in this moment. I strive to follow my mom’s example as I worry less about the future, leave the past behind me, and enjoy this breath that I am breathing right now. Health is precarious, and bodies fail just like my mom’s did. What lasts is the lives you uplift and the legacy you leave behind. I am my mom’s legacy, and I intend to make her proud through my career and by learning to love myself as she loved me. I encourage everyone to take a step back this holiday season and just be. Enjoy where your life is right now. It will never be here again. Death put a lot into perspective for me. Don’t let it do the same for you. Instead, let what you have in this life give you perspective and remember you are doing the best you can. Angelina Labonne was the Echo’s managing editor and later editor-in-chief during the 2016-2017 school year.